Buy one SAN 100% Pure Titanium Whey (1LB) & Get one FREE for $11.97 at Muscle and Strength. Shipping adds $5.89 (Free on $99). Available in Cookies and Cream. 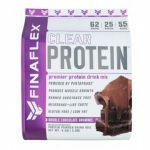 Buy 1 FINAFLEX Clear Protein – 1.5 Lbs., Get 1 one free for $29.99 at A1Supplements. Reviewers have given it “Excellent” 5/5 star rating .